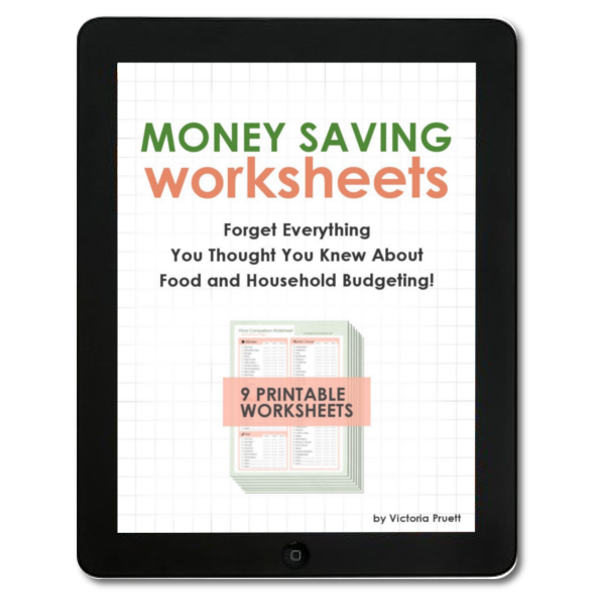 Money Saving Worksheets - Eat the Food You Love on a Tiny Budget! 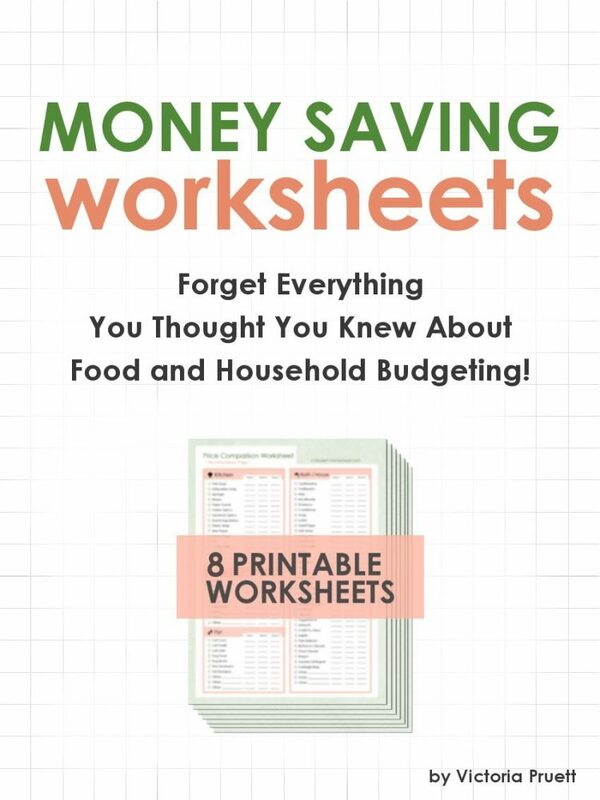 Money Saving Worksheets – Eat the Food You Love on a Tiny Budget! When I tell people that we spend less than $200 each month for our family of 3 to eat an all organic, grass fed diet, their first response is usually, “HOW?!”. After all, everyone wants to eat better, save more money, and keep the products they love. But there are a million seemingly impossible hurdles to overcome if you want to do it all on a budget. In fact, we used to spend over $1,000 a month to eat the SAME foods we are eating now!! With this system, we were able to change our budgeting habits and finally take control of our food expenses! Ready to save money on your food budget? Over 2,000 families have slashed their food budget with these Money Saving Worksheets! ✔Keep your family’s favorite recipes while saving money! ✔Learn where and when to buy the food you already enjoy! ✔Focus your habits to save BIG money without coupons! ✔Slash your budget to the bone, without losing what you love! UPDATED FOR 2019 WITH A QUICK START GUIDE, MEAL PLAN, and EXCEL FILE WORKSHEETS! Don’t miss out! Grab your copy now! Save Money TODAY with These Budgeting Worksheets! Are you feeling frustrated with your current budget? Do you need to save money but you really love the food and products you already buy? Maybe you had to cut costs immediately and so you’re having to eat way more “junk” type, pre-made foods than you really want to, but you feel stuck! I used to feel the same way. We spent years going back and forth between spending all our money on good food and forcing ourselves to deal with cheap food, and lesser quality household items because it’s all we thought we could afford. Maybe you are in a similar situation? Whether you are spending all your money on good quality food and household items, or trying to save by buying on the cheap side, this system is your solution. Or perhaps you suddenly need to cut a budget that was working for your family just fine. If you have found yourself in the position of needing to save big money immediately, due to a job loss, economic downturn, illness, or even the happy event of a child coming into the family, then you are in the right place! Note: This is not a system that show you how to eat the way we like to eat, or how to buy the products we like. This system is created to be fully customized to your lifestyle and family preferences! While we had always lived a frugal lifestyle, when I decided to stay home with our first child, I knew we needed to dig even deeper to avoid sacrificing quality. So, being the math nerd that I am, I plunged headfirst into the fine art of budgeting. After months of effort – creating, testing, failing, and starting again – I finally perfected 3 worksheet sets that I would be able to use over and over again to save our family real money. They have proven invaluable, and with minimal effort (once the sheets were created), I was able to cut our food budget from over $1000 a month down to $188!! In addition to all of our food savings, this system also helped us drastically cut our household budget! All in all, these worksheets saved us over $15,000 last year! After sharing this system with friends and family and seeing their results, I knew I needed to make it available to everyone! This book will show you exactly how to save money on the things you already use and love! UPDATE FOR 2019: All worksheets are not included in Excel format! With over 1,500 copies sold to date, this book has helped thousands of families cut their food and household budgets! Here’s what real readers are saying about Money Saving Worksheets. This ebook is one I wish I’d had a long time ago. It has completely flipped my menu planning/budgeting game on it’s head – in the very best possible way. The Money Saving Worksheets paid for themselves in less than 24 hours and I am telling all my friends about it! This ebook is worth way more than the price charged – proof that indeed, Victoria knows what she’s doing AND she genuinely wants to see you succeed, too. While we don’t always eat organic, these same principles apply to all foods – no matter how you choose to shop. I consider this a must-have resource for everyone who wants to save money. “I always struggle to keep our budget to a minimum amount and I never have seemed to be able too, not taking the time you did to figure it all out!! It does get frustrating for me so I was very excited when I received this information. UPDATED: A new Quick Start section has been added to this book to help you start saving money right now. It even includes a pre-made 5 week meal plan that lets you feed your family for $21 per person PER WEEK! In addition to the money saving worksheets that will provide information specific to your family, the products you already buy, and the food you already love… I’m including the full details on how to maximize the worksheets to eat better, plan faster, and keep more of your money! The book contains all the information regarding how to look at shopping, buying in bulk (if needed), and meal planning in order to save the most money on the food that you and your family like to eat. It doesn’t tell you what to buy, but rather helps you figure out the best things to buy within the items you already like. So it’s 3 chapters on how to save money and how to shift your mindset without giving up the foods you like… then another few chapters on how to use the worksheets with the information you now have from the first few chapters… then the worksheets themselves. The worksheets help you make a plan specific to your family, and help you enact the plan in an organized way. There is a quick start guide that has a meal plan and budget already set up that you can go out and buy right away, but the book is to help you buy what you like and doesn’t have specific foods to buy or stores to go to. This has helped us so much, and if you still have questions, please let me know! I hope this system helps with your grocery bill! Ready to get started saving money today? Take advantage of this amazing introductory price for a limited time only! If you are short on time and money, you need action fast! Don’t wait another second! Get started with this system right now to start seeing savings immediately! 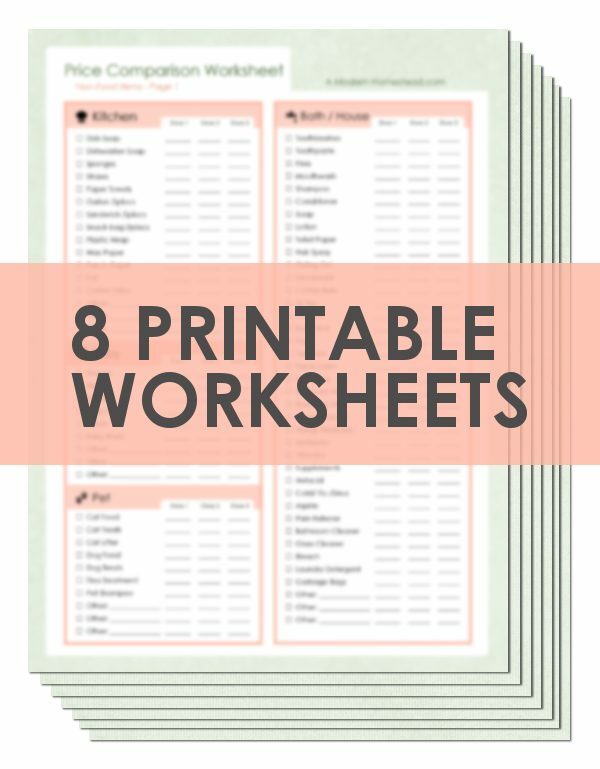 There are three worksheet sets included with this download (9 pages): one of which will start saving you massive amounts of money on day one. The other two need to be worked over the course of one week and will save you even more money with the information that you gather! You could stop there and just save the money that these sheets will save you… OR you can get really crazy and save even more than you ever thought possible! Not only are you getting the money saving worksheets that will provide information specific to your family, the products you already buy, and the food you already love… but you will also get the full details on how to maximize the worksheets to eat better, plan faster, and keep more of your money! This system is completely customizable to your life, whether you live in the USA, Canada, Europe or any where in the world! Do you have questions? Let me answer a few common questions. Can’t I just figure this out on my own? Well, if you have a particular love of math, endless spreadsheets, testing and revising systems, then yes – you probably could come up with your own system for saving money. But here’s a question for you: Why would you want to? Don’t waste your time reinventing the wheel on this one. Save your time and energy for things that you love and let me share with you the fruits of my labor. Why should I spend money on this if I’m trying to save money? Hey, I hear you. It kinda goes against the grain a bit. But at just $18 full price, how can you afford not to buy it when it offers you the ability to save SO much more than that! While you could go out and clip coupons and buy products you don’t really love to save money, this system lets you keep everything you love while saving WAY MORE than coupons could, and with very little effort compared to couponing! Like I said, how can you afford not to buy this?! Can You Really Save Money Without Cutting Out Much of Anything? Yes! When we looked at what my husband would be bringing in and how much we were spending each month, we knew that we needed to save money. Lots of money. But we also knew that we didn’t want to give up much (if anything). We were used to eating a diet full of grass-fed butter, all-natural and organic meats, and organic produce. We were used to eating high quality, organic einkorn flour for all of our wheat based foods. We had specific brands of this and that that I really didn’t want to forfeit just to save a few pennies. So I got busy. I put my love of math to the test, and I ended up saving $15,000 from our annual budget without cutting anything that we loved! Do I Have to Use Coupons? Nope! At least, I never do. Most of the things we buy don’t have coupons, so I just don’t worry about them. However, if you do have products that you like to buy with coupons, you will be able to save SO MUCH money with this set of worksheets. Is this just for food? While these sheets do focus mostly on food, I have also included sheets and information on how to save money on all the items you purchase for your household. Nope, it’s an ebook, available in pdf format only. Immediately after purchase, you will get the link to download in the payment confirmation window. Nothing will be mailed to you. This is an instant download to help you get started right away! Are the worksheets included in the form of excel spreadsheets? The entire book including the worksheets is 49 pages, and a little over 10,000 words. Since this is a digital product, I do not offer refunds. No problem. Feel free to email me at [email protected] and let me know what you need. Bloggers! — Interested in becoming an affiliate? I’d love to have you help me get the word out! Signing up is easy, and I pay a generous commission. You can find more information here.